Home > Events News > London calling - the future for transport in the capital? The streets of London need to be safer and cleaner, according to speakers at Tech XLR8, part of London Tech Week. Steve Rogerson reports. 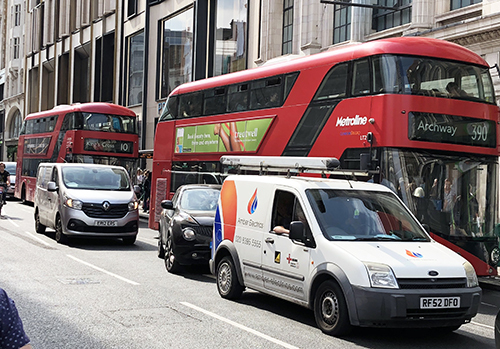 With its population increasing by the equivalent of two full double-decker buses a week, London faces particular difficulties just standing still, but the city’s leaders are not happy with that and have ambitious plans to lead when it comes to transforming the metropolis into a smart and connected place to live. It was thus fitting that Michael Hurwitz, Transport for London’s Director of Innovation, was one of the keynote speakers at the Tech XLR8 conference, part of June’s London Tech Week. One problem, he said, that London had was that it was designed using planning assumptions based on a world that no longer exists. The way people travel, work and communicate has changed dramatically and London’s infrastructure has to change accordingly. Things were improving. For example, in 2015, 64% of journeys in the capital were on foot, bicycle or public transports, but he said the target was to make that 80% by 2041. London already has the tube network and gives buses priority. “We try to force every second of efficiency out of the road,” said Hurwitz. The transport network should also improve significantly by the end of this year when the Elizabeth Line opens. This railway will stretch 100km from Reading and Heathrow Airport in the west, across central London, branching out to the Excel exhibition centre, where Tech XLR8 was held, and further out to Shenfield in the east. On top of the transport problems that TfL was tackling, he said the team was also trying to make London a healthier place to live. While he acknowledged the role autonomous pods could play for some areas of public transport, he said these were not always the answer. Sebastian Peck, Managing Director of InMotion Ventures, Jaguar Land Rover’s investment arm, said a diversified market structure had let ride-share companies such as Uber gain the scale they needed. And Liad Itzhak, a Vice President at mapping and location company Here Technologies, said ride-sharing companies were actually creating difficulties by increasing the number of taxis on the road, a problem that New York was facing. And he pointed out how Uber was operating by doing deals with other tech companies such as Yandex in Russia and Didi in China. All of this was geared towards trying to solve the main problem and that was people movement. But he said the industry did not understand that this was a matter of urgency. Perry said that while the industry got the concept of mobility as a service, it was being held back because individual car owners did not know how much they spend on their cars. “We have to go through an education phase to get them to know how much ownership of a car costs,” he said. But the culture problem really surfaces when the talk moves on to autonomous vehicles and safety. The trend towards smart cities is global, from villages in Africa to the giant metropolises in North America and Asia. In Europe, where public transport has always been a priority, it is not surprising that buses, trains and autonomous vehicles have been a focus for city planners. London hopes to lead the way. Can London change today and tomorrow with new technology? Automotive automation: 1.2m jobs at risk - could yours be next?